When it comes to marketing cosmetics, it is crucial to present your brand in a compelling and interesting way. After all, you’re selling products that promise to enhance your customers’ appearance. That’s what Estee Lauder did in their recent cosmetic gift with purchase promotion. The brand is giving away a custom cosmetic pouch with every Estee Lauder purchase of $150.00 USD or more. Great incentive for beauty and cosmetics enthusiasts as this customer incentive is not only practical but stylish as well. Sporting summery prints, their custom printed bag is small enough to fit in hand bags. This also makes a great travel companion as it makes organizing toiletries simple. What made their gift with purchase the center of attraction is their glass casing. The cosmetic POS display was simple yet, it exudes elegance and quality. 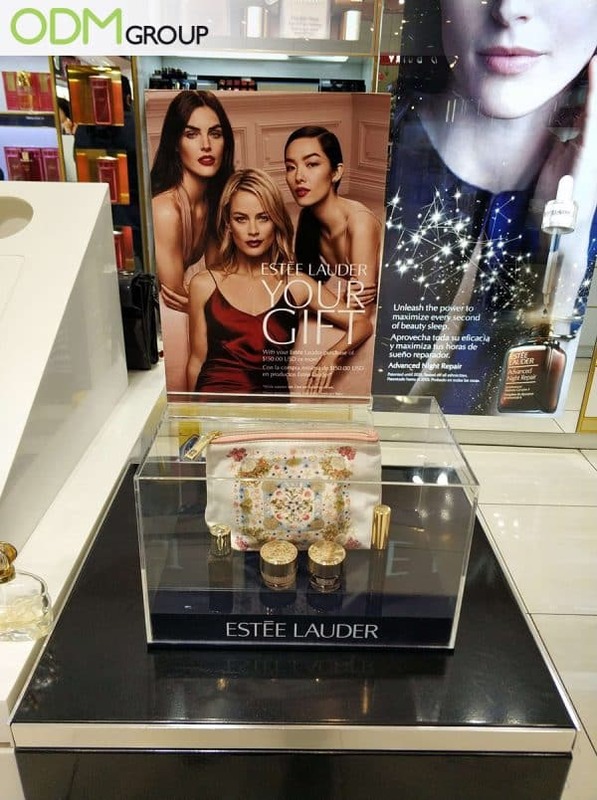 Since this Estee Lauder line of products is intended for women, the use of posters with pretty girls creates a powerful marketing message to their target audience. The posters are practically telling their female audience that they can make them look glamorous just like the models. In essence, the combination of effective POS display and cosmetic gift with purchase has helped the company get their message across effectively. So, if you’re planning a cosmetic gift with purchase campaign, here are factors to consider. Custom Toiletry Bag With David Beckham Fragrance Boosts Sales. Are the GWPs of Use to Customers? – What complimentary gift with purchase are you going to offer to your customers? Some of the most common GWPs are pouch bags and cosmetic tools such as a promotional nail file, nail clippers, custom pocket mirrors, and power banks in the shape of lipstick and mirrors. 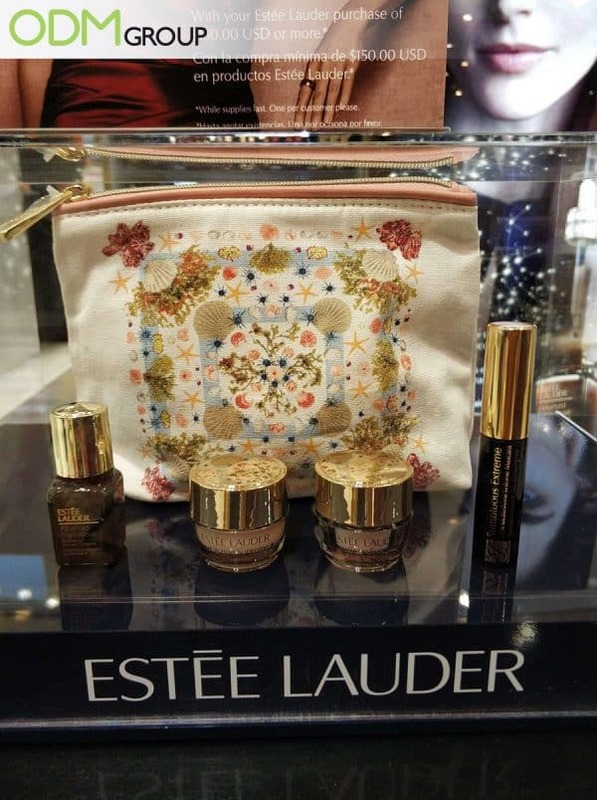 As for Estee Lauder, using a cosmetic bag as a GWP is a good choice because customers will surely use them on a regular basis, exposing their brand to many people. Thus, extending brand visibility beyond retail stores. Who will Manufacture my Cosmetic Gift With Purchase? – When looking for a promotional product company to manufacture your custom branded merchandise, consider their years of experience in the industry. Do they visit factories? Do they conduct factory audits? Are the factories compliant with international safety standards? If you are in need of promotional cosmetic products, don;t hesitate to contact The ODM Group. We have a team of designers and merchandisers who will help from start to finish. Speak with our team today to know your promotional product options. To help come up with great cosmetic marketing ideas, we have rounded up some of our favorite blogs below. Check them out! We love this gift set- from the free on pack gifts down to its packaging design. See what makes this product tick. Using marketing gift sets allows merchandisers to sell 2 or more products in one single transaction, increasing sales. For customers, this is a great deal as they get to score different items at a fairly lower price.